YAOUNDE, Aug 1 2013 (IPS) - The Kribi Seaport on the coast of southern Cameroon is destined to become a mega harbour to serve all of Central Africa. But there is little chance that locals, particularly engineers and scientists, will benefit much from the 567 million dollar development. With Cameroon only providing 15 percent of the construction cost and China funding the remaining 85 percent, the port is presently under construction by the China Harbour Engineering Company. But experts say that Cameroonians lack the professional training that is needed to work on these projects and will miss out on important employment opportunities. “Despite Chinese investment in terms of infrastructure and technology, [this will not] benefit the growing educated and unemployed population in Cameroon who lack the appropriate professional training to be absorbed by these projects. At the moment the country needs … engineers, doctors, and scientists,” Mengnjo Anselm Sahngeh, an economic policy analyst in Cameroon, tells IPS. The World Bank’s 2009 Cameroon Economic Update stated that the country has an unemployment rate of 30 percent, most of whom are unemployed youth with either degrees or diplomas from higher education institutions. According to the organisation’s 2013 Cameroon Economic Update Reducing Poverty, Vulnerability, and Risks – Special Issue on Social Safety Nets, this country’s economy grew five percent in 2012. But its overall poverty rate, which is close to 40 percent, has not declined but actually increased in some areas. “Poor infrastructure, an unfavourable business environment, and weak governance continue to hamper economic activity and make it difficult to reach the growth rates needed to reduce poverty in a sustainable manner,” the report stated. 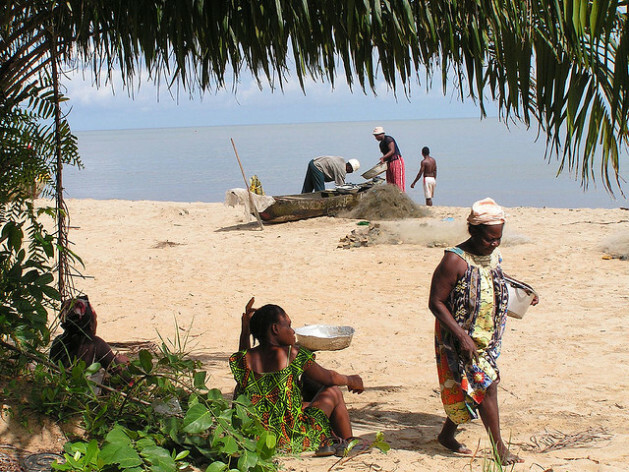 The deep-sea harbour, which is situated in the south region’s beach resort town Kribi, currently employs 1,125 people, 609 of them Cameroonians mostly employed as manual labourers. Daline-Louise Nsomotto of the Kribi seaport project coordination unit in the ministry of economy, planning and regional development tells IPS that the port will handle import and export of heavy goods. “This will fill the gaps of the [neighbouring] Douala seaport, which is only six to seven metres in depth and can only receive vessels with a capacity of 15,000 tonnes. Upon completion, the main port in Kribi, which is 16-25 metres in depth, will receive big vessels of close to 100,000 tonnes,” Nsomotto says. An industrial complex that will allow for a multipurpose docking port with 20 different terminals, an air base, an industrial site and a private residential area is also being built. “It is a new city that will be established,” Nsomotto adds. Frank Guet is a local businessman in Kribi. He says that despite the fact that Cameroonians had little to do with the development of the port, which started in December 2010, it had improved business in the town. “The seaport project has increased business and employment opportunities in this zone although prices of particular commodities, such as land and houses, have skyrocketed. Many are migrating towards the area where the port is being constructed demanding land for acquisition,” Guet tells IPS. Nsomotto says that the project’s priority is to use local skilled workers. “But local training schools do not satisfy the need of the present projects in Cameroon. “However, the transfer of technology is highly recommended by the government to enable continuity by local engineers after the project is delivered. To achieve this, we encourage the few young Cameroonian engineers to be [employed] alongside the foreign experts from China and other countries on the project,” Nsomotto says. According to the United Nations Industrial Development Organisation, Cameroon currently ranks 63rd of 74 developing countries in terms of the level of technical skill development in the country. Sahngeh points out that many developing countries are skipping the necessary steps of development and moving straight to large-scale industrialisation without building the essential institutions or training people to accommodate these developments. David Esseck Sany, director of training and professional orientation at the ministry of employment and vocational training tells IPS that Cameroon suffered the consequences of the brain-drain that is still plaguing most African countries. According to Sany, most of the large projects being built in Cameroon are in areas of work that demand the type of technical expertise that cannot be found locally. “Many higher learning institutions are being oriented today by the government to offer training in areas such as mining, high-tech engineering, energy, water and agriculture. This is to enable the implementation of the 30/70 law [of hiring 30 percent of foreigners and 70 percent of Cameroonians on a project] in all industries as much as possible,” Sany adds. But the transfer of skills to Cameroonians might still be difficult to achieve on Chinese-driven projects where it is reported that Chinese workers even undertake basic tasks like driving trucks. “It is very difficult to work with the Chinese when you don’t understand their language. [However], many Cameroonians are now learning the language in order to be incorporated in their projects,” Sany explains. Regardless of the Kribi seaport’s shortfalls, Sahngeh says that the project remains a great opportunity for the socio-economic development of the region. He says no sub-regional community can prosper without reliable infrastructural linkages and no country can be industrialised without a viable port infrastructure, be it sea or air. “The first phase of the project is 60 percent completed and, once realised, the Kribi port will become a hub of economic and trade activities in the whole region… The Kribi seaport could be a real lever to the industrialisation of Cameroon and the competitiveness of its products as the country will remain a regional access door to the sea for countries like Chad and Central African Republic,” he says. However, he cautions that this will be difficult unless Cameroonians receive the necessary skills and training to benefit from this. “It is unclear how this is logistically possible given the shortage of Cameroonians available to fulfil roles requiring technical skills that could attract foreign investment and foreign companies to engage in joint ventures with locals,” Sahngeh says.